Fasgadh is a traditional Victorian property on the eastern side of the Kintyre peninsula overlooking Tarbert Harbour. The house is of substantial stone construction, part painted and part exposed stone wall under a slate roof. Recent improvements include new windows, a new kitchen and re-plumbing. Inside the property has many Victorian features including a case iron fireplace and intricate plaster cornicing. The kitchen is large enough to accommodate a large dining table, while the dining room has views out over Tarbert Harbour. Accommodation in total comprises: hallway, sitting room, dining room, kitchen, study and bedroom one on the ground floor, and bedrooms two to five (two en-suite) upstairs. The second floor has a versatile attic room which could be an office, study or a sixth bedroom. Outside the mature gardens are laid mostly to lawn with shrub, bush and border plants, a terrace to the western side and steeper gardens into a rocky outcrop at the rear. The garden comes to around a quarter of an acre. Fasgadh is located on the water by Tarbert Harbour on the west coast of Scotland. 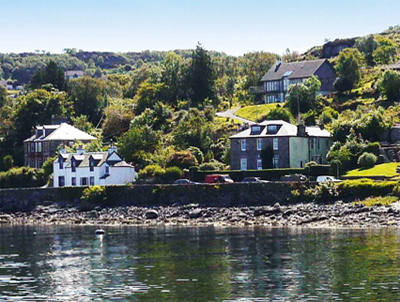 Tarbert itself is a well-loved pretty fishing village on the Kintyre peninsula. The guide price is £325,000. For further information please contact Strutt and Parker on 0141 225 3883 or visit www.struttandparker.com.